To succeed in a world of Accelerating Change, companies have to scan the market and technology trends, adjusting their business process and adapting new technologies to stay competitive. Engaging inside and outside of the supposed boundaries of an organization, playfully challenging everyone to bring their best game while making room for experimentation in a space where people can feel a deep sense of tribe and belonging fully optimizes the agility of an organization, thus creating a lasting competitive advantage. 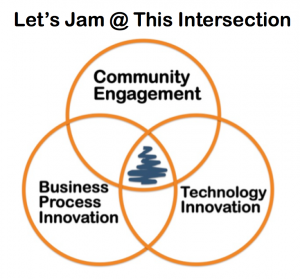 I, Mark Finnern am uniquely qualified to help you succeed at the intersection of Business Process and Technology Innovation with the help of deep People Engagement. I create cascading impact and engagement, increasing organizational awareness, resilience, and creativity. I developed and ran SAP’s Enterprise Tribe the SAP Mentors, comprised of the top ~ 150 community influencers of the SAP Ecosystem of ~3 million members (from inside and outside the organization). Together, we achieved a level of engagement with the SAP Mentors that is the envy of the competition. 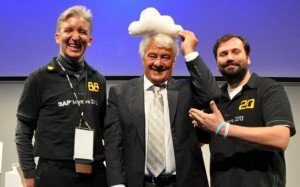 After an intense exchange during an hour-long webinar with the SAP Mentors, an SAP executive leans forward and says: “You guys [SAP Mentors] always seem to have fun.” I wondered what that was about. I looked deeper and realized the enormous influence that playfulness has on the engagement of people within an enterprise ecosystem. So much so, that I added playfulness as one of the pillars that the SAP Mentor Magic is built upon. The level of trust that the SAP Mentors have with each other enables us to jam/experiment, or even fail. SAP Mentors are jamming the SAP culture. Playfulness is not a requirement to become an SAP Mentor, but you have to supportive of other Mentor’s playfulness. Great example of mostly SAP Mentor driven playfulness are the legendary SCNotties 30 seconds of recognition videos including awards ceremony. “The beatings will continue until morale improves.” Really? You know you can’t force improvement of morale, and similarly, you can’t force a playful environment in an enterprise. It is an art of nurturing that creates conditions of trust, familiarity, an embrace of experimentation, and acceptance of failure that allows people to play and thus create an environment of excellence. The beatings will continue until morale improves. Really? You know you can’t force improvement of morale, and similarly you can’t force a playful environment in an enterprise. It is an art of nurturing that creates conditions of trust, familiarity, an embrace of experimentation, and acceptance of failure that allows people to play within an environment of excellence. An art based on the science of human behavior, group dynamics, and cooperation put into effective practice. That’s how it was for so many of us, myself included. The Mentors were, for me, the most vivid example of what I sometimes call a “culture of excellence,” people who were friendly and inclusive but also challenged the heck out of each other. It’s a model Mark Finnern envisioned that I will carry with me. I was able to create such an environment at SAP for and with the SAP Mentors. Let me help you create the same at your company. As if a magician, Mark Finnern creates communities from thin air around work, ideas, and local playfulness. 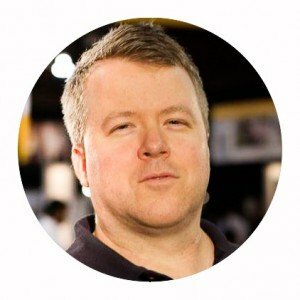 Recently Mark Finnern founded Playful Enterprise a boutique consultancy where he brings his “magic” social technology for engagement to organizations. Since 2003, Mark has hosted the Future Salon he founded: a get together of eclectic change makers curious about a world that works for all. At TEDx he shared his 5 Ideas on How to Bring All of Our Schools Into 21st Century. Mark initiated Sandwich and Play, a weekly informal play time of families in the San Mateo Highlands. He also founded and led the San Mateo Highlands Renegade Marching Band to two consecutive best of 4th of July parade wins. While it may seem like a romp at the circus, Mark Finnern’s magic creates the conditions for creativity and excellence so that communities and organizations can thrive in times of Accelerating Change.